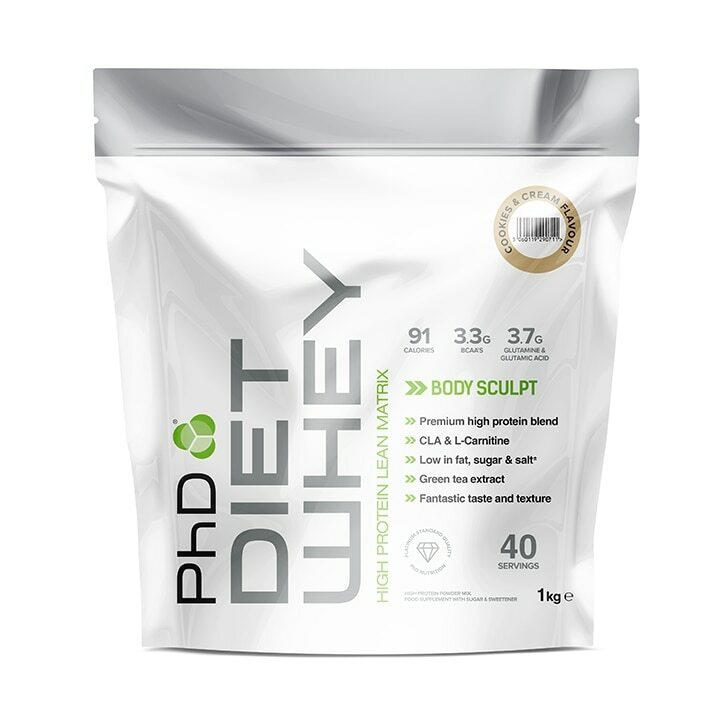 PhD Diet Whey Protein Powder is one of the industry-leading, high protein, low sugar, diet and slimming formulas for weight control. With a wide range of ingredients used in a variety of weight loss formulas, PhD Diet Whey is ideal for men and women following a weight management nutritional plan and looking to lose body fat and control calorie intake. Incredibly versatile, mix PhD Diet Whey Protein Powder with yoghurt to make a delicious dessert, or combine with porridge oats or pancake mix for a tasty & filling breakfast. Blend 25g PhD Diet Whey Powder Chocolate Mint with 175ml cold water. Use 2-3 servings daily to help support adequate protein intake.Take any time of the day pre- or post-workout. PhD Diet Whey Powder Cookies & Cream is rated 4.6 out of 5 by 22.